Drew Goddard started his career somehow by surprise. Everything he touched was more or less a hit and his acquaintance with Whedon family did not harm. His list of jobs as a writer (and later also producer) includes: Lost, Buffy the Vampire Slayer, Daredevil, The Martian and World War Z. Nonetheless, he barely tried to direct something. His first attempt wasn’t very warmly welcomed by the critics and, to be honest, was nothing exceptional for me, too. The script was lazy and even with an open ending and a lot of thoughts behind it, the plot was simply boring. And this was why I was very unsure of the El Royale. Goddard decided to try his power as a director yet again and I wasn’t sure I can trust his vision. I was caught by surprise. My expectations weren’t high, but they were rising throughout the screening.The film trailers weren’t telling much. We had a couple of strangers in a hotel, being, well, strange to one another. The El Royale did not seem very popular and it may be an exaggeration that all the guests came on the same day, at the same time. But let’s make it a little artsy touch for now. The film was selling the same feeling. Through the first scenes, we were more or less introduced to their behaviour but not necessarily personalities. I could feel all the awkwardness filling the whole hall and, to some extent, fear. Then, we’re also introduced to Miles – the receptionist/bartender/carer/everything at the hotel. And in minutes the keys are given, and the plot tightens. We get to the Tarantino-esque chapter-like parts with room numbers as titles. Each room equals a story of a person who stayed there. What I enjoyed is – there was not much of a pattern. It was telling the information important to the plot and to the character. Sometimes it was the backstory, sometimes the things the guest was doing while in El Royale. Each chapter was both used for the audience and the story, which can be tricky and completely disastrous (Suicide Squad, for the worst example). This scheme was going throughout the whole film, but it did not break the inspiration of the process. The times of each part were different and completely irrelevant. And the system gave an even more mysterious touch. The interactions between characters begin again in short while. While discovering their true purpose of the visit, the drama is getting further. Only after we’re getting fond of our El Royale flatmates, their small talk giggles turn to quite bloody surprises. The secrets behind each face are getting darker, just to leave enough room for yet another player. It was amazing that the film is something different while being obvious. There is no need for less cliché ending nor any sort of eccentricity. This is a poetry: classic yet beautiful. The story takes roughly 12 hours, according to the director. In the interview (linked below) he admits it was a pain to keep the details and logic on set. He cared about every detail such as the placement of a bottle of whisky. I noticed, and I appreciate. Then, the cuts and editing were quite astonishing. There was a touch dedicated to each character and the camera was almost flying for most of the time. I was mesmerized. I couldn’t think about anything, just the present moment of the film. But this wouldn’t work if it wasn’t for acting. I could feel the tension between Hemsworth and Bridges, fighting to give more incredible experience. They were completely different but just as charismatic and strong as characters. One, the so-called priest, looking for a treasure. The other – well – a cult leader. Jeff Bridges was showing more by his eyes and his face. He did not need anything else to express the emotions and tragedies inside an old man. I could feel his panic and sadness going from the screen through my spine, giving me all the shivers. Chris Hemsworth was a different speech. He played with his whole godlike body and expressing the madness of his character while being calm. Just for the record: you have to appreciate Chris’ ABS, his snake-like moves and two bags of charisma. Mesmerizing! Anyway, the acting contest was won by yet another player. Cynthia Erivo, great vocalist from Broadway stole the show completely. Her vocal as her sword, she slew all her colleagues with these minutes she was singing. Woah. Nothing but appreciation. And yeah, to the acting skills as well. Showing human emotions and being fragile yet strong is a balance not so easy to get. Smaller roles of Jon Hamm, Lewis Pullman and young Cailee Spaeny were also performances worth noticing. The only downside in acting was Dakota Johnson. Apart from her badass entrance, she was more of a bystander who eventually did not fit to the persona she was trying to sell earlier. 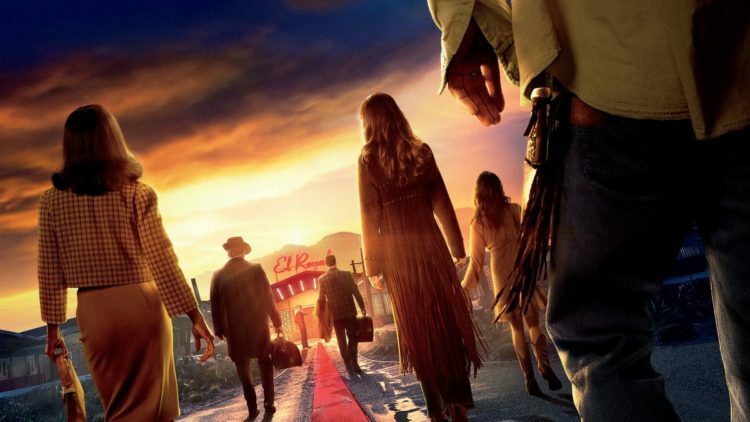 In the end, The bad times at the El Royale is an entertainment on Friday evening. But the one that will keep you in your cinema’s spot (or your sofa) for over two hours. You will cry, you will laugh and you will have a worthy evening that you will want to talk about.